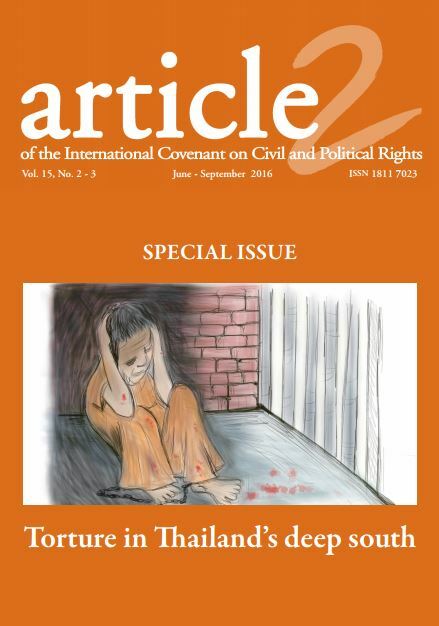 This special issue of article 2 features an abridged and edited version of a landmark report on the use of torture by the military, paramilitary and other state security forces in the far south of Thailand. 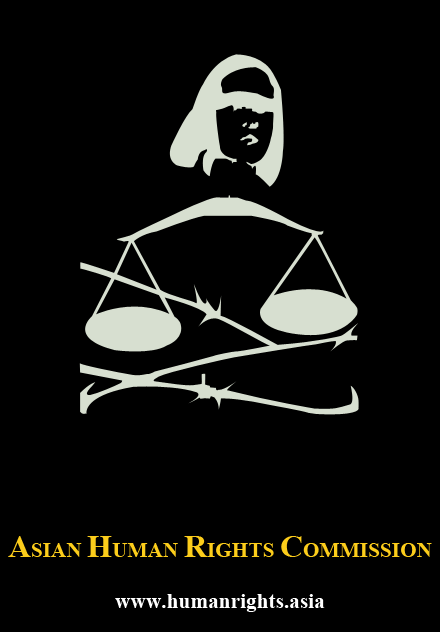 The report, which was prepared by three locally based groups of human rights defenders—the Cross Cultural Foundation (CrCF), Duayjai, and the Patani Human Rights Organisation (HAP)—features excerpts from 54 cases of torture documented in Thailand’s southernmost provinces, on its border with Malaysia, during 2014-15. The cases were all documented in accordance with the Istanbul Protocol for working with survivors of torture, and with the support of the United Nations Voluntary Fund for Victims of Torture. We have waited over a decade for a detailed report on torture used by state security personnel in the southernmost provinces of Thailand, where since the early 2000s the army, police and paramilitary units—most commonly, rangers—have aggressively confronted a resurgent secessionist movement. From early on it was obvious to anyone familiar with the work of the security forces in Thailand that detainees accused of being involved in the antigovernment political programme, whether as active insurgents or supporters, would be tortured. However, working on such cases, or even just talking about them, posed heavy risks. In March 2004 the prominent human rights lawyer Somchai Neelaphaijit announced publicly that five men in the south whom he expected to represent had been hung from doors and beaten by the police to confess to involvement in a raid on a government armory. The following day, policemen abducted him from his car on a busy street in Bangkok. He was never seen again. Somchai’s abduction and disappearance had a chilling effect on others who might have been emboldened to act. And not only he but also many other advocates for public causes were in this period being subjected to threats that all too often were realized in the form of killings (see the special report, ‘Rule of law versus rule of lords in Thailand’, article 2, vol. 4, no. 2, April 2005, for details). It was the period immediately after the so-called “war on drugs”, during which, in a period of a few months over 2000 people are estimated to have been gunned down in their houses, bars and restaurants, cars and on the streets of cities and towns around the country (see ‘Extrajudicial killings of alleged drug dealers in Thailand’, article 2, vol. 2, no. 3, June 2003). Extrajudicial killing was commonplace, and human rights defenders documenting cases of torture and abuse in police stations far away from areas of the country disturbed by civil unrest who were pursued by the alleged perpetrators or others acting on their behalf had good reason to be worried for their safety. Torture survivors who dared to complain were exposed to serious threats and lacked protection (see the special report ‘Protecting witnesses or perverting justice in Thailand’, article 2, vol. 5, no. 3). It was not an easy time to defend human rights in Thailand, least of all, in the heavily militarized and brutalized south. It is still not easy. Today times have changed, but certainly not for the better. Thailand is ruled by a military junta, its second in the years since the southern violence resurged in the early 2000s. Yet despite the ebb and flow of authoritarian politics in Bangkok, and the persistent militarization of the south, human rights groups have formed and collaborated to document and recount the use of torture by state security forces in the centre, as well as in the south. In Bangkok, Thai Lawyers for Human Rights (TLHR) has played a vanguard role in documenting alleged torture in the political cases it has been handling in court, and in newly reestablished military tribunals to try civilians: a method of political rather than judicial prosecution that constitutes an unprecedented development in contemporary Thailand and speaks to how profoundly regressive the current dictatorship in the country is, even in comparison to its earlier iterations. 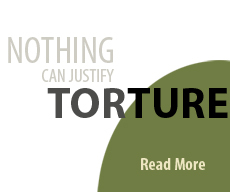 On the first anniversary of the coup, in June 2015, TLHR reported that it alone was handling 18 cases where the accused reported having been severely tortured during interrogation. 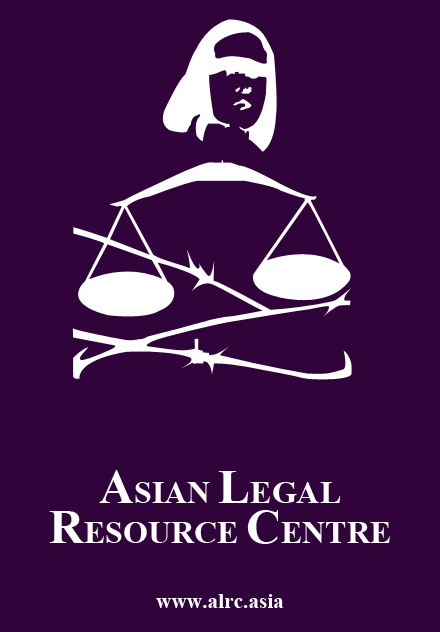 For further commentary on the situation in Thailand post-coup, we invite readers to turn to the analysis of the Asian Legal Resource Centre that concludes this special issue (‘Thailand: Survivors of torture denied justice by military dictatorship’), and to the appended report by TLHR (‘The force of the gun camouflaged as law: Two years of rule by the NCPO’). In the country’s south, Bangkok-based CrCF joined with its local partners Duayjai and HAP in 2014 and 2015 to collect and document the 54 cases contained in this report. Consistent with the Istanbul Protocol, and in view of the conditions in the south of Thailand, all identifying details, including the names of the survivors, have been omitted from the publication. This necessity led the military shortly after the report was first released in January 2016 to declare it a fabrication: a characteristic action that it has in common with other militaries and officials accused of systematic atrocities in recent times, including some in the United States following the release of the Senate Select Committee report on the use of torture by the CIA in December 2014. However, the army in Thailand did not stop at issuing blanket denials of the crimes that its personnel have committed, but soon began pursuing the human rights defenders who documented and issued this report. In June 2016 it contacted one of the three to inform her that it would be initiating criminal proceedings against them for defamation and violation of the draconian Computer Crimes Act, under which it is possible to be prosecuted for literally any activity online in Thailand that state security personnel deem to constitute a threat to the national interests—read as the interests of the armed forces. She and the two co-editors of the report have since received summons to appear and answer to the charges. An outline of the actions taken against these three human rights defenders can be found in this issue of article 2 (‘Human rights defenders under attack in Thailand, again’, by the Thailand Desk of the Asian Human Rights Commission). The editorial board of article 2 has decided to reproduce the report of torture in the southernmost parts of Thailand documented by these human rights defenders and their colleagues both because its contents can and must be known more widely, and as an act of solidarity with them in the face of the insistence of the army in Thailand that it be permitted to continue to torture and kill people in Pattani, Yala and Narathiwat with impunity and without scrutiny, as it has done for well over a decade now. In doing so it delivers a message to those responsible for the prosecution of the report’s authors and editors, that they ought not be so stupid as to think that a ham-fisted attempt at criminalizing human rights documentation will succeed in preventing the work of these groups, or the further dissemination of their tremendously important findings. We take this opportunity to congratulate our colleagues in Thailand for the work undertaken to prepare this report and work closely with the survivors of torture in the far south. This issue of article 2 is dedicated to them. Although its contents make for grim reading, they are contents that must be read, and acted upon, if the scourge of torture in Thailand’s south, and indeed, in the country as a whole, is to be ended.